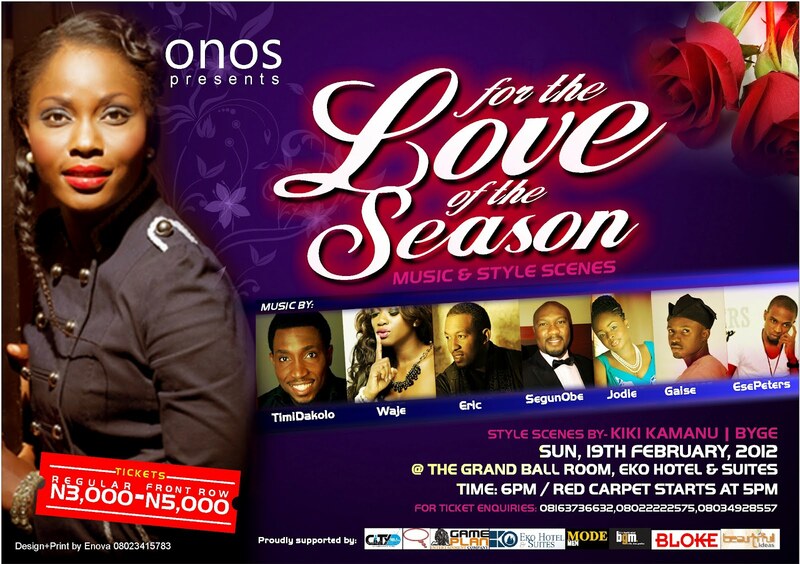 ‘For The Love Of The Season’ an event put together by one of Nigeria’s finest and most talented Gospel Artists, ONOS. The concert is being put together to celebrate the Valentine season and would feature some of Nigeria’s finest music acts namely Waje, Timi Dakolo, Jodie, Eric, Gaise, Segun Obey, Ese Peters to name a few and it also features a fashion Exhibition by Kiki Kamanu and Byge. With this music and fashion Valentine event, she hopes to along with her friends; spread the Love that is so real to them. The comperes for the evening are Julius ‘The Genius’ Agwu and Titi (Inspiration fm). There will also be comedy by MC Abbey and Jedi. 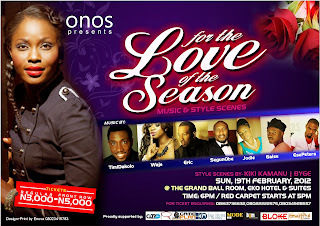 The event is slated for the 19th of February 2012 at the Grand Ball Room, Eko Hotel and Suites for 6pm (Red carpet starts for 5pm). This event is proudly supported by Eko Hotel & Suites, City Fm, Black Gold Magazine, Mode Men Magazine, Bloke Lounge, TW Magazine, Game Plan Entertainment, Akara Ogheneworo Photography, Beautiful Ideas, PagaTech Ltd.
For ticket enquiries, please call 08163736632, 08022222575, 08034928557, 08037277904.